Jeff Hann generated a wave of interest around multitouch in 2006 with his Ted talk. 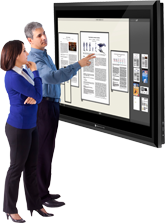 He later founded Perceptive Pixel, and the company has recently anounced a new 82 inch multitouch display. You can watch the demo here. This entry was posted in Platforms, Tables/Surfaces. Bookmark the permalink.